Detailed last week, Apple's new CarPlay infotainment system is the Cupertino company's way of integrating your iPhone in the car. 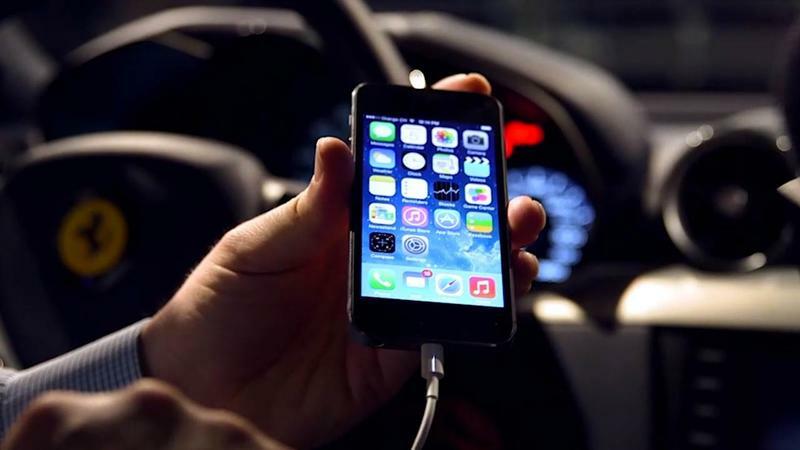 The system is designed to be an eyes-free solution that allows users to safely use their iPhone right in the car's built-in display. You can perform functions such as getting directions, making calls, sending and receiving messages, and listening to music. The goal is to mimic the mobile experience, but through a car's in-dash display. While there are no CarPlay vehicles on the road just yet, we got a chance to check the system out in a Ferrari FF. As you'd imagine, CarPlay heavily focuses on using Siri for voice control, which has been "specifically designed for driving scenarios" inside Apple's new CarPlay system. You'll be able to talk to your car and tell it what to do, including playing a particular song or reading your messages. All you need to do to activate Siri is press and hold the voice button on your steering wheel, and the digital assistant will pop up. During our brief demo, Siri worked incredibly well, and felt intuitive and natural in an auto environment. Right now, confirmed apps supported by CarPlay include Spotify, Podcasts, Beats Radio, iHeartRadio and Stitcher, with others likely to come down the road (car pun). Of course, things like Apple Maps also works, giving you information such as turn-by-turn directions, traffic conditions and more. The functionality as as you'd expect from porting an iOS-like experience over into a car. Things looks familiar, and performing actions is largely the same—it's just a tad more analog inside of a car, where there are more physicals dials and buttons. CarPlay will be supported by a number of big automakers later this year, including Ferrari, Honda, Hyundai, Ford, Chevy, Kia, Volvo and more. Specific models already announced to support CarPlay include the Volvo XC90 SUV, Mercedes-Benz C-Class and the Ferrari FF, which we got to see demonstrated at the 2014 Geneva Motor Show. BMW, Subaru and Land Rover are also expected to support CarPlay. Incidentally, CarPlay support just launched inside iOS 7.1, which was released on Monday. Your car's existing infotainment system will still be there, but if you own an iPhone, simply plugging it into your car will bring up CarPlay, which will allow you to perform familiar actions on an interface that mimics iOS. This isn't an actual Apple car OS or anything like that—Apple actually partnered with BlackBerry's QNX to bring CarPlay to life. CarPlay looks great in action, and performs exactly as expected. As more integration comes, the experience will likely evolve. So far, the early signs are promising, it's just unfortunate we couldn't take the Ferrari FF to try CarPlay out while the car was actually in motion.